"For prehistoric man who sheltered in the many caves, for the catholic heretics who defied the Church, and for resistance fighters, war-time refugees and downed WWII pilots who eluded the Nazis to escape over the mountains into Spain," the Ariège Pyrénées have a long history of serving as a refuge. Today, this unspoiled region attracts those eager to escape from the stresses of modern life, and cyclists wearied of persecution by vehicular traffic. Although we found the High Pyrenees a spectacular and historic place to cycle, we enjoyed the Ariege Pyrenees as much or even more. We never thought, in advance, that the two areas would compare, but after tallying all the check marks from our exhaustive field testing and crunching the numbers through our proprietary, mathematical bike tour formulas... we can declare a virtual dead heat. Now I'm left with the difficult task of explaining to the humble reader (that's you) how such a conclusion can be drawn. If you sat in for the two-part High Pyrenees show aired earlier this month, then you'll note immediately that the Ariege isn't quite as spectacular, and perhaps doesn't rank as high in the “friggin', jaw-dropping, gorgeous” category. But here's where it does top the charts: The region has countless, quiet, picturesque, one-lane, rolling and often challenging country roads extending in all directions, and sprinkled with charming villages. The main roads follow the valleys and are sometimes almost flat, but it's easy to find routes that branch off and over steep cols. The roads are in terrific shape; I don't recall a single pothole. For those keeping score at home, this is our 4th day in the Pyrenees, and our 3rd cycling day. We left the High Pyrenees the day before for our new base camp in the Ariege. The drive from St. Savin to Massat was about 3 hours. 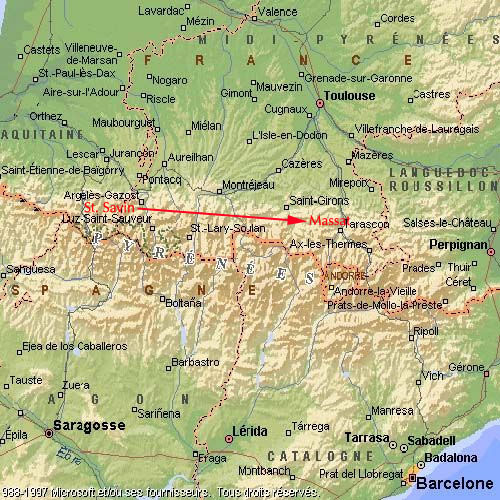 We traveled along the A64 highway that runs parallel and north of the Pyrenees. We exited at St. Gaudens and then reentered the Pyrenees at Aspet where we stopped to pick up food at the farmer's market in miserable cold, damp weather. 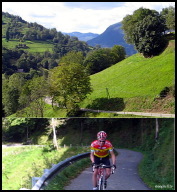 We then continued along the D5 and over the Col de Portet d'Aspet onto St. Girons. St. Girons is where Lance Armstrong sets up his base camp when training in the area, but we were headed to a smaller, quieter part of the Ariege called the Masset Valley. Starting in the valley, we rode through the town of Masset, just 2k from our lodge on D618, where residents were still digesting after their annual ox roast the day before. 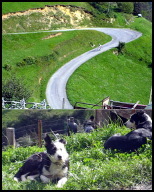 A sharp right turn took us south, up a gentle one-lane road until we reached Col de Saraille some 6k later. The col on the other side descends through the town of Cominac, more aptly termed a hamlet, as it consists of only few farms and houses clustered together. The descent opens up, offering a great view of the French-Spanish Pyrenees border and Mt. Valier in particular, one of the highest peaks at 2838m. Once we hit the valley, we followed the Garbet and Salat rivers to Seix, an attractive, medieval-looking town where we stopped to warm up. Although it was mostly sunny, there was a cool breeze. Then we headed west towards the Col de la Core, the day's main event. Col de la Core is one of the more famous cols in the Ariege, and it was the highlight of our figure eight-shaped metric century on this day. We were attacking it from the east side, which is a little easier than the route from the west. 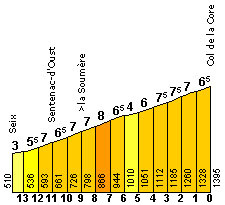 When approached from Seix, Col de la Core raises 835m over 14k with a 6% grade most of the way. (see video right). 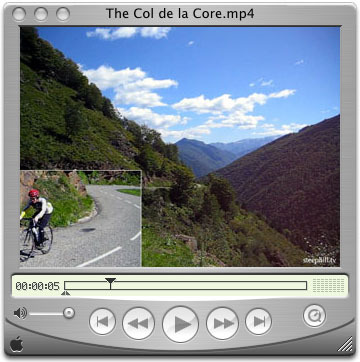 Last year in the 2004 Tour de France, the Core was the 3rd of 7 climbs taking riders 205k from Lannemezan to Plateau de Beille. "The peloton started to fragment on the Col de la Core" in Stage 13, and the day ended with another classic Lance Armstrong win this time over a very strong Ivan Basso. Here are some other Graham Watson photos from the difficult and exciting stage 13 race through the Ariege. Col de Latrape (cat 2), Col d'Agnes (cat 1) and Port de Lers (cat 3) were the 4th, 5th and 6th climbs that day, which we also experienced on our 3rd cycling day in the Ariege. Crossing paths with touring cyclists in Seix. We'll have more Seix in another report. Is that a smile or chattering teeth?